Those of you who regularly read this blog will know that increasing diversity is a top priority for the leadership of the Civil Service. This is not only right thing to do, but, as the Head of the Civil Service recently pointed out, it also makes good business sense. Put simply, ensuring all our talent can shine will mean we deliver better service. But can better services also help to deliver a more diverse public sector? The nature of our work at the Crown Prosecution Service (CPS) means we see the link between our performance as an employer and the service we provide particularly clearly. We exist to prosecute crime on behalf of the public we serve – and we deal frequently with crimes that affect particular groups differently. Take racist hate crime. In recent years we have significantly improved our performance on prosecuting these crimes. CPS data shows that in 2005/06 we brought 8,868 prosecutions for racially and religiously aggravated hate crime, and secured a conviction in 74% of these cases. Since 2010-11 the number of prosecutions each year has been consistently over 11,000, with at least 83% of these ending in a conviction. Is this improvement linked to the relatively good representation of black and minority ethnic (BAME) people in the CPS? Our overall proportion of BAME staff has grown from under 10% in 2003 to more than 16% today and importantly BAME employees are represented at most grades in a broadly similar pattern to the overall workforce. Let me be clear – I absolutely do not believe that our improvement in this area is down to our BAME staff alone. But I am sure that communities are more likely to have confidence in an organisation which better reflects them – and that has a real impact on our ability to bring successful prosecutions. We rely on members of the public to report crime and to support prosecutions by giving evidence. They are more likely to do this if they are confident in the CPS and wider criminal justice system. But might this also go one step further - might we attract and retain more BAME staff because as an organisation we are clearly committed to tackling issues that disproportionately affect BAME people? We are proud of our performance in this area, but it hasn’t always been this way. Fifteen years ago an independent report was very critical of the CPS attitudes towards race – highlighting both the experiences of BAME staff and the potential impact on the treatment of BAME defendants, victims and witnesses. That led to a huge focus being put on equality in the CPS, with sustained efforts to develop an inclusive and fair working environment, and service to the public. We focused on diversity in all its forms and at any point where we could have an impact. For example, there was a high proportion of female staff in our overall workforce, but women filled only 21% of our most senior roles in 2003. By 2015 that figure had risen to 52%. We monitored every stage of any recruitment or internal promotion process – and introduced representative selection panels to improve our decisions in this area. We put a strong focus on role modelling, particularly in our recruitment – clearly demonstrating that we value diversity to the people we want to join us. And we have had progressive employment policies, helping us to attract those who want to work in a more flexible way. We work closely with our staff networks, making sure we hear first hand about the experiences of our staff then work together to develop and put in place measures to address any issues. And we have been proactive in encouraging our staff to access cross-civil service schemes such as the positive action pathways. We still have more to do, and the updated Civil Service Talent Action Plan and social mobility strategy, due in the Spring, will help set our future direction of travel, ensuring we continue to make progress on this vital issue. It’s not possible to quantify the impact of any one of these individual actions, on either our staffing diversity or our prosecutions. But what is clear to me is that our work on both these issues complements the other – and benefits us all. We’re not tackling hate crime to attract staff; we do it to deliver justice. And we don’t treat our staff equally to support prosecutions; we do it because it is fair. But like all civil servants we are here to serve the public – and that affects everything we do. Never miss a post - click here to subscribe to the blog and stay in the loop. The Civil Service Fast Stream vs Oxford: which is more socially diverse? While Alison's sentiments cannot be challenged might I as member of the awkward squad throw a points to throw into the mix. "Communities are more likely to have confidence in an organisation which better reflects them (sic). 66% of CPS staff are female, as are the DPP and many of the senior staff yet I am guessing 90% of defendants are male. Looking at things from a different perspective might not the "male community" take the view that CPS is a female dominated organisation that persecutes men? If BAME (which I think is insulting as it sounds like something off Dr Who) make up 10-11% of the UK population but make up 16% of the CPS workforce surely it is white people who are underrepresented? The linking of the improvement in the prosecution rate for race and religious hate crime to increased recruitment of BAME is, in my view, unfortunate as it discounts other obvious factors such as improved policing in this area and better trained and hence better performing prosecutors of all races and religions. The new CPS policy on diversity is: "White men, we don't want you and certainly not at the top. But if you're good enough, we'll reluctantly put up with you." *wink* (do everything not to employ more white men). It's funny how the Civil Service champions over-representation of women but would never look at why this is so. It is always the other way around. For example, if 66% of CPS staff are female why are we celebrating that we have forced the percentage of women in higher roles to 52% but NOT looking at why men have failed to be recruited. There's no analysis to back up any of Alison Saunders claims. It's just her 'feels'. As a barrister you can always choose your 'feels' to manipulate people into backing your agenda. That's why we need dedicated data analysis. "Is this improvement [+9% conviction rate of hate crime 05/06 to 10/11] linked to the relatively good representation of black and minority ethnic (BAME) people in the CPS?" Who knows, but I suspect mass immigration has meant the situation has changed fundamentally since 05/06. 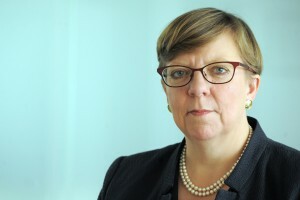 The significant omission in all Alison Saunders comments seems to be the suffering to those falsely charged, and/or falsely convicted. This seems never to enter into her decision making process, and that's disappointing. "might we attract and retain more BAME staff because as an organisation we are clearly committed to tackling issues that disproportionately affect BAME people?" The inference being that BAME (I hate that acronym) staff are only interested in dealing with crime that happens to BAME people. I seriously don't know what to make of that, but if I was an ethnic minority staff member of the CPS, I wouldn't be at all happy with my director.